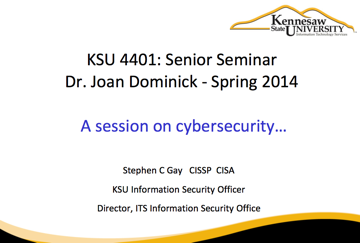 Stephen Gay is the Information Security Officer at Kennesaw State University, the third-largest university in Georgia. Stephen has over 16 years of IT experience within higher education and has spent the past 7 years focused exclusively on Information Security. As the Director of the ITS Information Security Office, Stephen leads the team responsible for the design, implementation, testing, evaluation, and evolution of IT security solutions at KSU. An advocate for integrating security within the organization, he has orchestrated projects such as enterprise IT policy & procedures, contingency planning for IT services, sensitive data scanning & remediation, and was part of KSU’s award-winning identity and access management implementation team. Stephen holds a BS in Political Science and a BS in Information Security and Assurance from KSU. He is also an active CISSP and CISA.